It's really surprising how much time the little things can take. The horn for instance took 4 hours to mount and the radiator overflow tank took almost 8 hours to design, fabricate, paint and mount. A lot of people decide to make things easy by picking up a little horn and just stick it somewhere out of sight. My preference for a 30's era rod is the classic AOOOGA horn. They tend to be pretty big so hiding one of them can be a challenge. In this case I searched for the smallest AOOOGA horn I could find, which I just happened to find at Harbor Freight of all places. It's about 12" long and 3" in diameter at its largest point and this makes it a bit easier to tuck up under the bottom of the frame and under the floor. The horn mounting boss was not very impressive when it comes to strength so I decided to add another mount by fabricating a clamp around the rear of the horn and attaching that to the bracket as well. This additional mount added stability and allowed the horn to be mounted pointing slightly down. This angle will direct the sound down so it will resonate off the pavement and add a bit of volume to its AOOOOOGA sound. 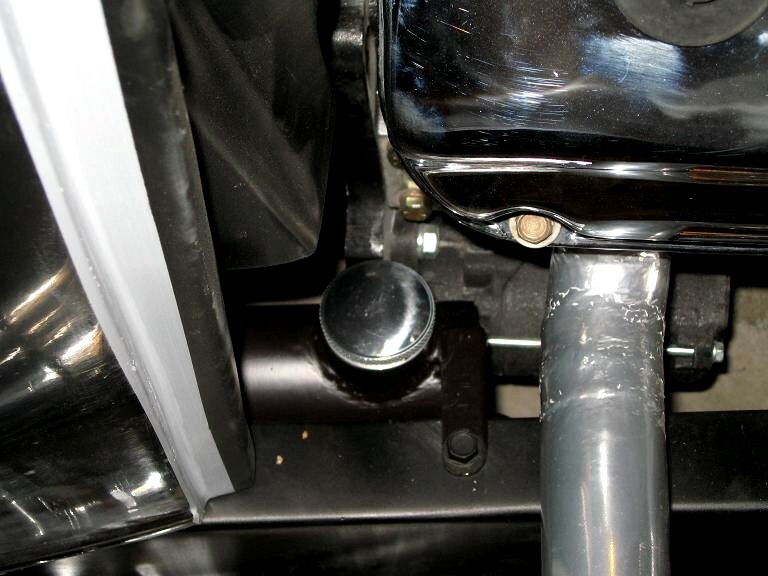 Below is a picture of the radiator overflow tank. When it comes to one of these many people just pick up one of the chrome tanks that mount on the side of the radiator and call it good. That type of tank is fine and I've used them in the past but just won't fit the "theme" of this project, especially since nothing like that was available back in 1964. Back in the day people were making these out of oil filter canisters and even glass bottles. I did consider an oil filter canister but the one I had would have been too big. Since I spent so many hours modifying the firewall to look more realistic, I knew I didn't want to mount it there. So given that I wanted a mounting location where the tank would not be in the way, my choices were a little limited. I finally decided to mount it just behind the passenger's header on the inside of the frame rail which will allow easy fill access but still be almost completely out of the way. The tank was made from a 12" piece of 3 1/2" diameter exhaust tubing. Based on the location I chose I new it needed to be squeezed a little for clearance. A couple minutes in a bench vice gave me an oval shape, which has more than enough clearance and still will not protrude below the frame rail. In this location the removable cap will be about 3" in front of the firewall. One will just need to be careful removing the cap if the headers are still hot.... but generally speaking this will not be a problem. The tank was sealed inside with fiberglass resin and will hold just about a quart of coolant which should be plenty. The next order of business is mounting the body so I can make final adjustments to the locations of the peddles and linkages along with planning for the wiring and where the mechanical gauge lines will exit the firewall. 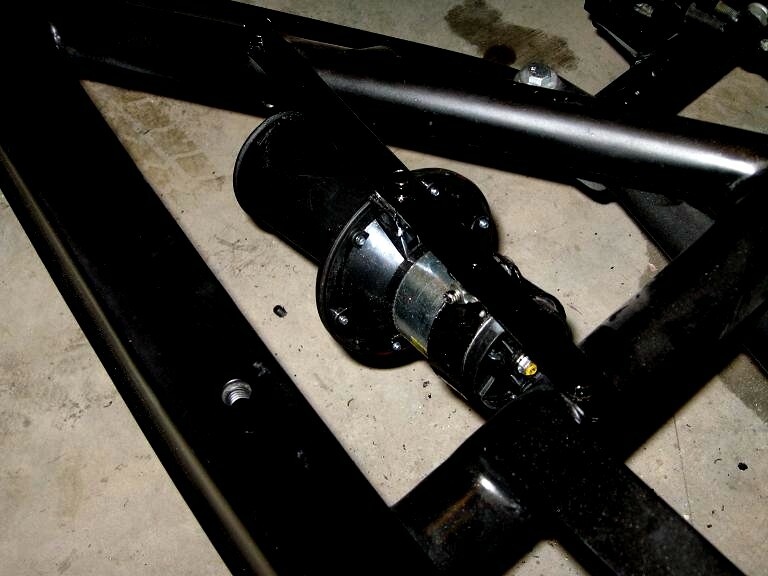 Once that is done the body will be permanently bolted to the chassis.